Stanislas "The Manislas"  Wawrinka (born 28 March 1985 in Lausanne) is a Swiss professional tennis player. His career ranking high is #9, achieved on 9 June 2008. He considers clay his best surface, and his backhand his best shot. He won the gold medal for Switzerland in the men's doubles event at the 2008 Summer Olympics in Beijing, partnering Roger Federer, by beating Swedish team Simon Aspelin/Thomas Johansson in the final. They were also honoured with the 2008 Swiss Team of the Year Award. John McEnroe believes Wawrinka has one of the most powerful backhands he has ever seen and describes him as having "the best one-handed backhand in the game today". The surname Wawrinka is of Polish origin. His father Wolfram is German, and his mother Isabelle is Swiss. His mother works as a biodynamic farmer helping handicapped people. Wawrinka's grandparents are Czech. He has one older brother Jonathan, who teaches tennis, and two younger sisters Djanaée and Naëlla, who are students and tennis players. 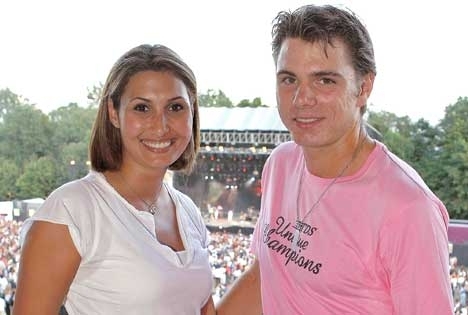 Wawrinka currently lives in Saint-Barthélemy (10 minutes from Lausanne) with his wife, Ilham Vuilloud, a Swiss television presenter and former fashion model. They married on December 15, 2009. Vuilloud gave birth to the couple's first child, a girl named Alexia, on February 12, 2010. On January 4, 2011, Swiss media announced that Wawrinka quit his family less than a year after the birth of his daughter to dedicate himself to tennis, having only five more years to make an impact. His hobbies include movies and music. He is good friends with British number 1 Andy Murray (both are fanatical go-karters) and Roger Federer. Wawrinka's corporate sponsors include Lacoste, Head, adidas and Hublot Genève. He plays using Head tennis racquets. As of June 2010, he played with the YOUTEK Prestige Pro MidPlus. Previously he used the Flexpoint Prestige MidPlus and Microgel Prestige pro. Stanislas Wawrinka claimed his maiden Chennai Open title beating Xavier Malisse in a highly competitive final. Playing in front of a packed Centre Court crowd at the SDAT Centre, Nungambakkam, third seed Stanislas Wawrinka managed to hold off a fast-charging Xavier Malisse to pocket his first title in Chennai with a 7-6, 4-6, 6-1 win on Sunday. As it has come to be expected of Wawrinka, the final was no breeze in the park, going all the way to the third set. The Swiss ace got off to the worst possible start, with Malisse breaking his serve at the end of a gruelling 10 minute first game. Wawrinka clawed his way to deuce from 15-40 down and then had three separate chances to put the game away. But the 2007 champion, Malisse, hung in there, until at the fourth time of asking, he managed to claim the break. Wawrinka sent a backhand stroke long at the end of a strong rally to give the Belgian the go-ahead. But in the eighth game of the set, the man playing in his familiar cool blue T-shirt, managed to break back. Malisse made three errors in that game to give Wawrinka two break points, and a classic pass from the third seed left the Belgian with no answers. With the score all square at 4-4, it seemed the set would head to a tie-break until Wawrinka stepped up the pressure in the twelfth game. Malisse managed to save two set points in that game, but the third was too much of an ask, and the seventh seed could only hit the net with a running forehand after a deep forehand crosscourt from Wawrinka. That first set itself took an hour and three minutes but the second was a more routine affair, with a solitary break of serve enabling Malisse to level the match. The break came in the third game when Wawrinka made two-successive errors from Deuce, to gift the break away. Wawrinka first sent a forehand down the line wide to give Advantage to the Belgian and then netted a backhand on the crucial point. Malisse was largely untroubled for the remainder of that set with his serve going down well for the most part. He also hit quite a few forehand winners and managed to effectively come to the net on quite a few occasions to either put away a volley or to force Wawrinka into an errant pass. In the third set however, it was all Wawrinka. Malisse’s serve deserted him in the deciding set as he managed to get in only 40% of his first serves. Wawrinka on the other hand picked up quite a few points on his first serve, sending down a thunderous 76% in the set. That eventually proved to be the difference between the two players, as Wawrinka was able to be more aggressive as a result. He broke Malisse’s serve in the very second game of the set, taking the fight to the Belgian and forcing him to make uncharacteristic errors. Wawrinka approached the net at the end of a long rally and forced Malisse to send a backhand slice wide for 0-15. After winning two points, Malisse netted a forehand to bring the score to 30-30. A double fault gave Wawrinka a break point and a wide forehand towards the corner gave the Swiss star a 2-0 head-start. Wawrinka broke Malisse again in the sixth game of the set to all but make sure of victory. A brilliant forehand down the line winner took the score to 15-15. A long rally was finished off with a backhand whip to the corner for 30-30 and a forehand wide from Malisse took the score to 30-40. Wawrinka then pulled out a forehand crosscourt pass from way behind the baseline to take the score to 5-1. Serving for the set, Wawrinka won three straight points to pocket three Match points and despite losing one of those, a good serve out wide followed by a strong forehand approach to the net, enabled last year’s losing finalist, to put away an overhead smash and wrap up the match. Stanislas Wawrinka produced a brilliant game, showcasing Swiss accuracy and style to race away with a win in the Chennai Open semifinal. Wawrinka played an amazing all-round game on Centre Court at the SDAT Centre, Nungambakkam, to topple top seed Tomas Berdych 6-4, 6-1 and enter the Chennai Open final. He will be up against Belgian Xavier Malisse in the summit clash on Sunday, after the veteran seventh seed beat Serbian Janko Tipsarevic 3-6, 6-3, 6-2 in the first semifinal. There was no sign of exhaustion for the third-seed Wawrinka from a late-finishing three-set quarterfinal match on Friday against Robin Haase. Berdych served first and the first four games were a mere warm-up for the action later. In the fifth game, Wawrinka, wearing his familiar cool-blue T-shirt, broke Berych's serve to take a 3-2 lead, hitting a delightful backhand crosscourt winner on the crucial point. He had earlier in that game hit a couple of glorious forehand winners and his consistent shot-making proved too good for his Czech opponent. The sheer weight of his first serve was enough to see him through the remaining games, as despite being under some pressure in the 10th game, Wawrinka managed to land the first punch and take the set in 38 minutes. Berdych tried his best to fight back in that 10th game as Wawrinka served for the set, but two booming aces at 134 and 135 miles per hour pulled him ahead to 40-30. Despite netting a forehand for Deuce, a good serve forced Berdych to net a forehand for Advantage to the Swiss star, who came out on top after a long rally to make the set his own. He eased away from Berdych in the second set, playing some brilliant tennis to go up a break in the third game. From 15-15, the world No.6 netted two consecutive forehands to give Wawrinka two break points and then double faulted to gift away the game. Berdych then lost out in his next service game as well, hitting far too many unforced errors in the fifth game. Under no pressure, he hit a forehand long to go down 0-15. Another error from his forehand brought the score to 30-30 and a brilliant backhand pass down the line from Wawrinka got him a break point at 30-40. Berdych fought back to get the game to Deuce but Wawrinka dominated from there on in, hitting a deep forehand crosscourt at the end of a long rally, forcing Berdych to net for Advantage. Then the top seed missed an attempted forehand down the line after a crosscourt rally, to give the second break to his opponent. Wawrinka held serve for 5-1 and then with Berdych serving to stay in the match, broke his serve again for a well deserved win. Berdych had raced to a 40-15 lead but Wawrinka got to the net after a good approach shot to put away a volley for 40-30. He then hit a forehand winner for Deuce and played a wonderful point to get Advantage. The majestic backhand down the line he hit with Berdych seemingly in control of the point showcased the class of the world No.21. Then in the final point of the match, Berdych came in to the net off his serve to try and disrupt the rhythm of the Swiss ace, only for Wawrinka to respond with a delightful backhand lob that just caught the baseline. With that a thoroughly dominating win was wrapped up inside an hour and 16 minutes and with it Wawrinka levelled his head-to-head with Berdych at 4-4. After the match, Wawrinka said his game was improving with every match he played. "It is not easy to get back on form in the first tournament after two months out but I am playing better with every match. Today, I played one of my best matches and focussed hard on my level. I served well on the big points and the work put in right through last year to be more aggressive on my serve and forehand is paying off for me," he said. Wawrinka was a losing finalist in Chennai last year and said he intends to correct that record. "Playing a final is always special and I will give it my best. It will not be easy as (Xavier) Malisse is playing very well this week. This is my first game against him and will be interesting to see how it goes. I am sure it will be a tough final but my aim will be to try and enjoy the match," he added.